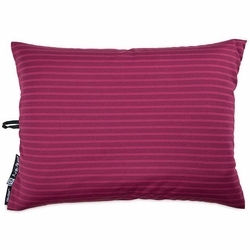 NEMO Fillo Elite Pillow. New for 2016, this ultralight version of our best-selling Fillo™ pillow is a fraction of the weight and packed size. A layer of Stratofiber™ synthetic insulation combined with a 3" bladder provides impressive height and cushion despite its ethereal weight. Fillo™ Elite's The TPU bladder gives superior cushion with miniscule pack size. The integrated stuff sack is about the size of a tennis ball, ideal for the backcountry or even keeping in your pocket for an emergency nap.